Tuesday With the Kims - Jill Ruth & Co.
As I worked on projects, the tea brewed. Kind of nice to live isolated from the street and road, you can have a tree stacked on your porch and no one sees. Until you post it on your blog. So, this is what I'm up to this week. Wedding centerpieces, wedding veil, putting "stuff" away, marking, taking to my booth, and listing on Etsy, after my weekend of buying. Visit other Tea on Tuesday posts here at Kim's blog. Truth be told: I may have made that sun tea just to post for Tea on Tuesday and to show you my new jar. I may not drink much of it! Sun tea! That sounds (and looks) good. It is sunny and supposed to be 75° here today. Friday we have a 60% chance of snow! That sun tea looks wonderful. I was telling Yvonne that the sun's too low for sun tea in the morning in my part of the world, but I love the look of yours. And if you don't drink it, we'll still understand. 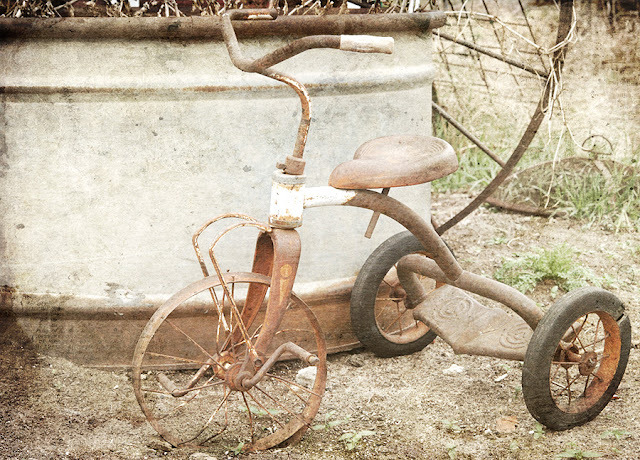 And being a lover of rust, I really admire the photo of the trike you bought this weekend. A bit of photoshopping it didn't seem to hurt, either. Really like your tricycle photo. Two textures make such a difference! So Jill, where do you have a booth? And we need to see more wedding details! 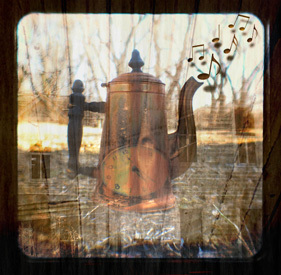 I love the vintage look of your spigot pot. 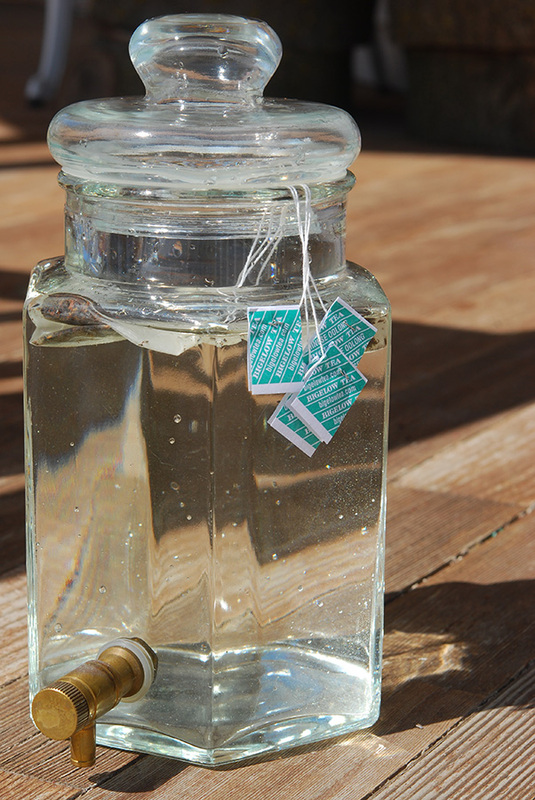 Perfect way to make some delicious sun tea. And I am so enjoying your photoshop pictures. I'm still trying to learn the basics, but I'm always inspired by others like yourself who make such beautiful images. Thanks for the delicious tea! p.s. and your altered photo IS amazing...that trike is a gem! I may have to follow you lane just to get a peak at that WONDERFUL tricyle! 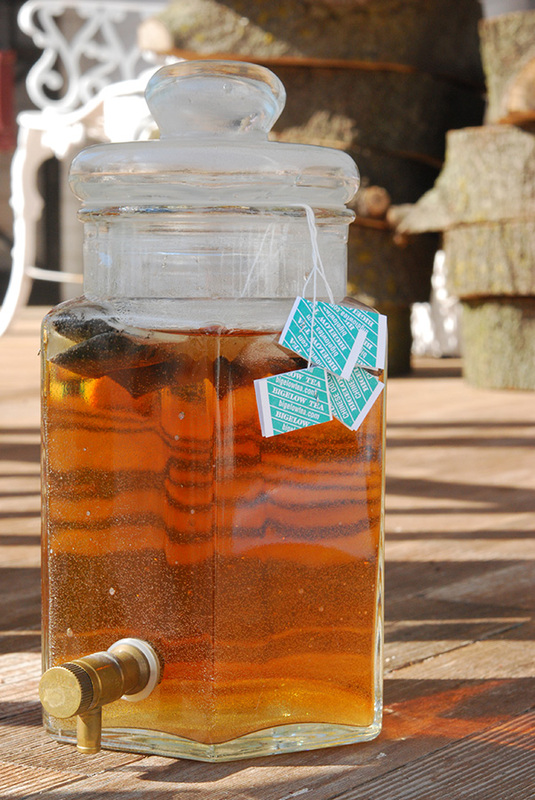 Your sun tea looks good, very cool jar! I had to laugh - I sometimes do things for the sake of a pretty photo, too. Ah, blogging! Love the stack of wood slices. I'm eager to see what you'll be doing with them. Sun tea.. YUM.. Used to make it all the time when we lived in Arizona since it took no time at all in the 100 degree plus temps to brew. WOOT! Look at us go...It seems the more I do, the more I want to do more. Loving it! Did you see the martha episode where she sands down slabs like you have? Swoon! Well even if you don't drink the tea, you have some great teabags there! (I save the teabag paper for projects ... And half of my tea goes down the drain .... But those teabags .... I save every single one!!!) I will have to investigate your Etsy shop ..... You shop on the weekends and then sell on Etsy? Sounds like WAY too much fun! Love your images here! I found you through Texture Tuesday. Your texture picture is great. 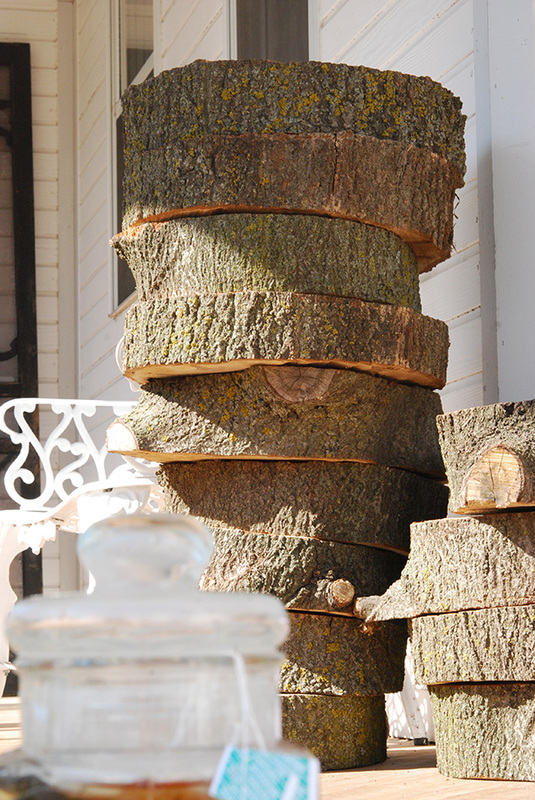 Truth be told my favorite of all the images on this post is the image of the tree stack! I would love to have a stack of trees like that to bring to school and use with my students.